Included on the Ontario’s Missing Adults website are Search Pages to help visitors navigate the databases. Searches can be customized to allow for searches that are as broad or narrow as the visitor chooses. Search results can also be sorted by date of disappearance/discovery, or age at disappearance/discovery. Results generated by the Missing Adults Search page can also be sorted according to Surname. If you wish to view all cases, you can do so by opening the Search Missing Adults or Search Unidentified Adults page and simply hitting the ‘Submit’ button located at the bottom of the page. The search operations of the Search Missing Adults and Search Unidentified Adults are similar. Our file naming convention is also specific to Ontario’s Missing Adults. When contacting police, please include the Case Reference number located under the “Contact” section as this indicates the police agency file number. The databases can be searched by a number of different characteristics. The number of results will differ depending on the number of characteristics used. If you are unsure of a characteristic, you may leave it blank to return the maximum number of results. 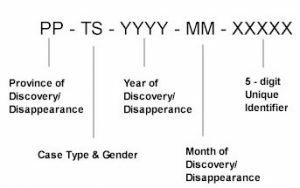 Specific dates can be entered by filling in the month, day and year of the disappearance/discovery in the space provided. Calendars appear to assist in selecting specific date. The format is MM/DD/YYYY. If no value is entered as the end date, the current date is entered by default. This section is used to search the city from which the person went missing, or where the unidentified remains were discovered. To select multiple categories, click on the appropriate boxes. This section allows you to enter specific age ranges. Please note that age refers to the age at the time of the disappearance, or the estimated age of the unidentified at the time of death. Each measure refers to the height or weight at the time of the disappearance/discovery. The keyword search function allows visitors to search the database for specific words. By default, the search function searches for common word endings. For example, keyword search entry time. The search results page will return a case list where the words time, times, timed appear. If including several keywords, the search results page will return those cases containing all of the keywords. To search for a specific phrase, enter the phrase in ” ” (for example: “blue jeans”). This field can also be used to search for specific police agencies.